To see what I mean, look at these new renderings of the first two graphs of my old post. 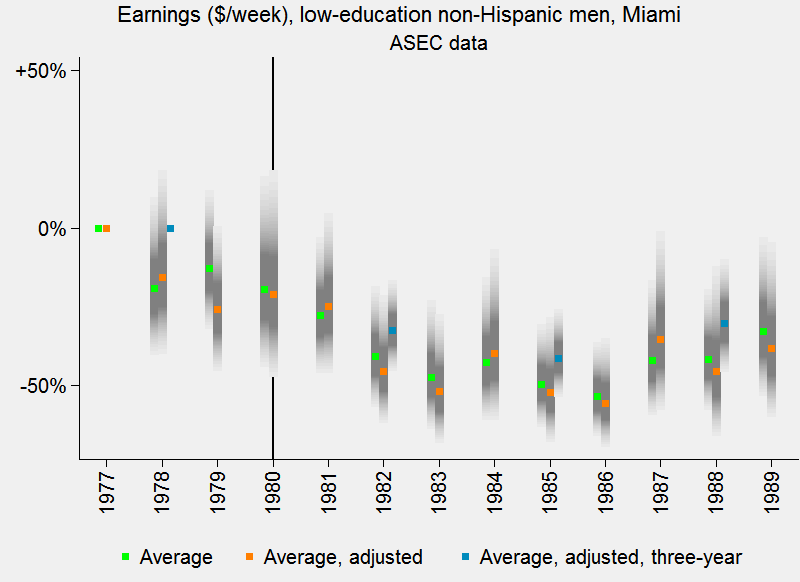 Borjas uses two different Census Bureau data sets, so my two graphs plot average earnings in both. 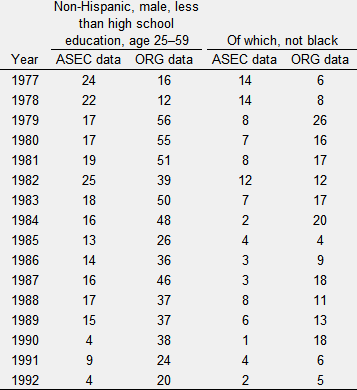 (The data sets are labeled “ASEC” for Annual Social and Economic Supplement and “ORG” for “Outgoing Rotation Group” and are explained in my old post.) Both copy Borjas in restricting to male non-Hispanics aged 25–59 without a high school education. The green dots show changes since the starting year, 1977. The orange dots adjust those numbers in exact analogy with Borjas’s 2015 analysis.1 The sparser blue dots, again imitating Borjas, take three-year averages. The leftmost dots are zero by definition, since the graph shows changes from the start. The remaining dots are set inside 95% confidence ranges, the equivalent of pollsters’ margins of error. 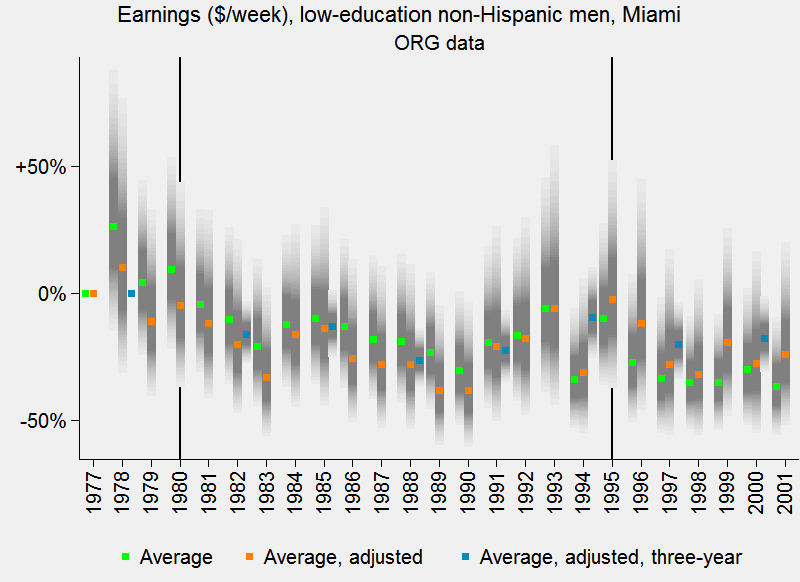 Moreover, the Borjas results look rather mined: they are attained by dropping Hispanics, dropping women, dropping people who completed high school, and looking at trends in wages rather than unemployment. I would thus quibble with Clemens and Hunt in one respect. In my mind, the lack of any sudden wage drop at the time of the boatlift constitutes the main “flaw” in the Borjas analysis. And if the sudden drop is not there, it’s not begging for an explanation. 2. Nevertheless, Clemens and Hunt point up an interesting discovery. If that discovery can explain the long-term decline in wages in the Borjas sample—and they convince me that it can—it further weakens the case for the Mariel boatlift as a wage driver. As I mentioned, the Census Bureau began boosting the number of low-income blacks it interviewed in Miami for its monthly economic surveys—the surveys that generate Borjas’s data. Clemens and Hunt detail the historical reasons for this push, above all, the belief that blacks were underrepresented in Census surveys. The push coincided almost perfectly with the onset of the Mariel boatlift. Borjas makes a subtle but interesting point in reply: Yes, coverage of low-income blacks surged circa 1980. But of the two Census Bureau surveys he uses, the ASEC exhibits this spike most sharply, and that survey asks people how much they earned last year. Thus we should expect the coverage jump in 1980 to create the appearance of an earnings fall between 1978 to 1979, before Mariel. But if, as I contend, there is no strong evidence of a sudden wage drop in 1980, then it does not matter as much if the coverage of blacks increased out of step with the boatlift. 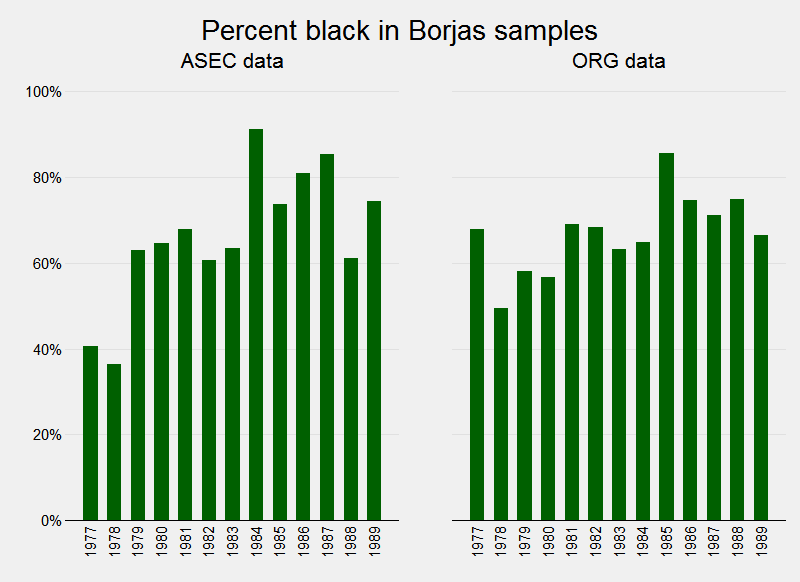 The useful insight we can retain is that the long-term rise in coverage of low-income blacks in both data sets helps explain the long-term fall in wages in the Borjas samples. To the extent that Borjas is leaning on long-term trends, the new discovery weakens his case. Some of those confidence intervals are really wide. 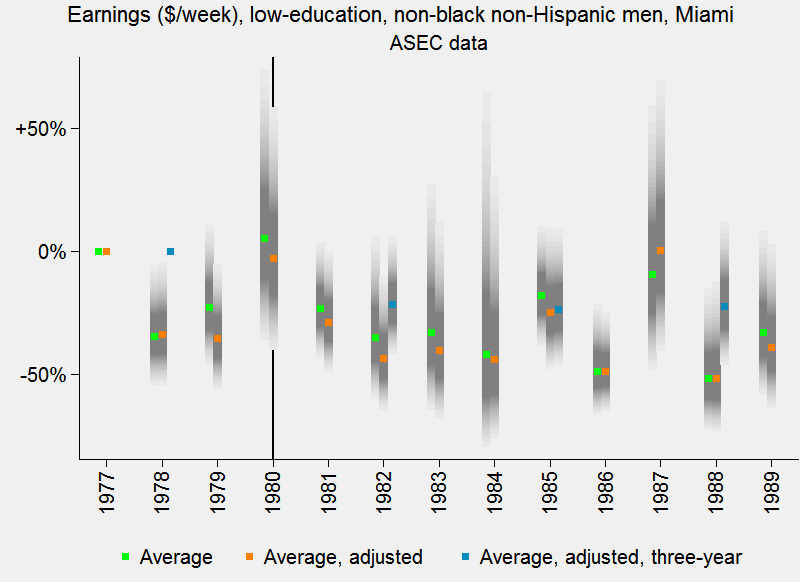 For example, looking at the blue dots in the second graph, we can say with 95% confidence that the change in earnings for low-education, non-black, non-hispanic men between 1977–79 and 1981–83 was between +10% and –39%. 4. I appreciate Borjas’s transparency, if not his tone. 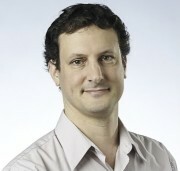 It is gradually becoming more common for researchers to post their data and computer code. Borjas appears to do so routinely, sometimes even without waiting for acceptance by an academic journal. This has facilitated high-quality, public debate over his work. Regressing across Card’s five cities and controlling for year, age, and city effects.